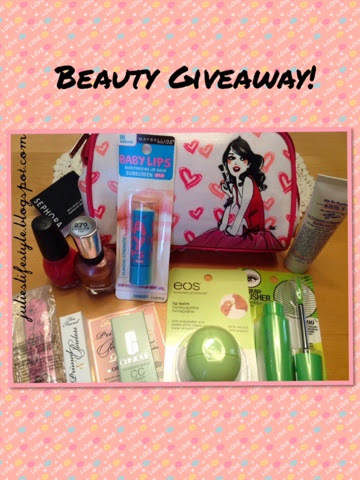 Julie's Creative Lifestyle: MM - Spring Beauty Giveaway! ATTENTION: THIS GIVEAWAY IS CLOSED! Hello friends, I love makeup and as you know I have been hosting a Makeup Monday Series on my blog for 14 weeks now. To say thanks for your loyalty and support come join me in this fun giveaway. HERE IS WHAT THE WINNER OF THE GIVEAWAY WILL RECEIVE! 1) Be or become a follower of my blog Julie's Lifestyle by Google Friend Connect or Bloglovin. If you were stranded on a tropical island, what is the one makeup must-have you would bring? 3) The Giveaway will end on Friday April 18th at 9:00pm EST. The winner will be announced on Monday April 21st at Makeup Monday. Good luck and have fun with this! See you all next Monday. WOWZA! What a fabulous giveaway my friend! I would be thrilled to win...I see all kinds of things I really need! Let's see, I would need a lifetime supply of Curel lotion to stay soft and smooth and my lip gloss! For makeup....my cover up for under my eyes. I don't want to scare the pirates when they come to rescue me! lol I'm a follower and a friend! Hugs! I follow on bloglovin and I would choose my eyeliner as it is what i don't like leaving the house without. I would bring a mascara and a BB Cream. Wouldn't want to get burned! I'm a follower already..:) And...if I were stranded on an island, I would have to have mascara! You can't tell I have eyelashes without it...lol! And if I could have two items, the second would be BB Cream! Love it...:) Thanks for hosting a fun giveaway! Thank you for having a giveaway - hugs to you! I would take red lipstick as when I'm down this cheers me up ,haha.. Thank you for the opportunity to win this giveaway. Lipstick, without a doubt! I have a big thing for lipstick. This is not including skin care but just makeup! lol. I would say tinted moisturizer with SPF! I also would say tinted moisturizer with SPF, and mascara and lip balm if I could sneak them in! Please don't enter me b/c I haven't been part of your Mondays -- yet. I will be now!! I follow you on Google+ and now GFC. 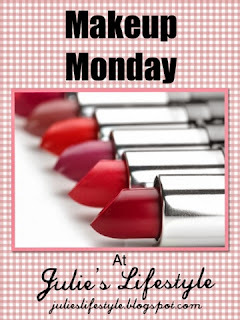 © Julie's Creative Lifestyle: MM - Spring Beauty Giveaway!